New York City is an incredible place that one has to see and experience at least once in their life. With such offerings as Times Square, Broadway, Wall Street, and Rockefeller Center, Manhattan appeases the needs of nearly every culture or social desire. If you want to try the best pizza in the world, where do you go? If you wish to have the best hot dog, what’s your destination? The Big Apple is the place to get any style of food from any country, and still manages to give it that ‘fugetaboutit’ charm. So when it came down to me grabbing some wings in the “Capital of the World,” I was looking forward to it. My younger brother, though born in Jersey, has New York blood and has lived in the City for many years. So when the time came for him to move cross-country and exchange the “City That Never Sleeps” for the “City of Angels,” we all got together to wish him luck. And where did we go you ask? Well, only one of the best known wing sports bars in town… Blondies Sports. Ever since this whole wing website started, he’s been trying to get me to try them out as they claim to have some of NYC’s best wings. So, the family came in to bid farewell, and while at it, ordered up a ton of wings to see how New Yorkers Bring The Wing! Blondies, just like almost every other bar in the city, is a small, crammed pub that pretty much requires a reservation, especially when there’s 9 of us. What sets this bar apart from the rest is how incredibly polite and courteous the wait staff was. But despite the great pleasantries, I still have a job to do. So, we ordered up a variety of poultry set for a king: My mother got the Medium, while my step-sister got the boneless. My brother got the 20 count, while my wife got the tenders with wing sauce on the side. I, however, asked fot the 10 count of Hot with sides of the “Sizzlin” and “Ouch” (which I thought was a clever name). The wings came out nice and hot with a smell that permeated the air to let the rest of the restaurant know that we were in the house. Although the size was a bit larger, the sauce itself was a little on the “normal” side. It was a Frank’s Hot Sauce blend that gets your lips tingling and yet still offered classic flavor, but when you’re looking for the best wings out there, “normal” needs to be amped up a bit. On the flip side, the sauce consistency was great as it stuck beautifully to each piece preventing that annoying watery drip that some sauces tend to have. The wings were fried and served with a medley of carrots and celery. And in classic NY fashion, anything extra, costs extra. So if you’re looking to get a side of sauces, for example, be prepared to spend a little more. However, if I could offer any advice to keep things simple, it would be to order the Hot and leave it at that. They have about seven different levels of heat, and though my mother’s Medium was more like a mild and the Hotter sauces such as the “Ouch” were nothing to write home about, my Hot hit the spot just right and were very enjoyable to eat. 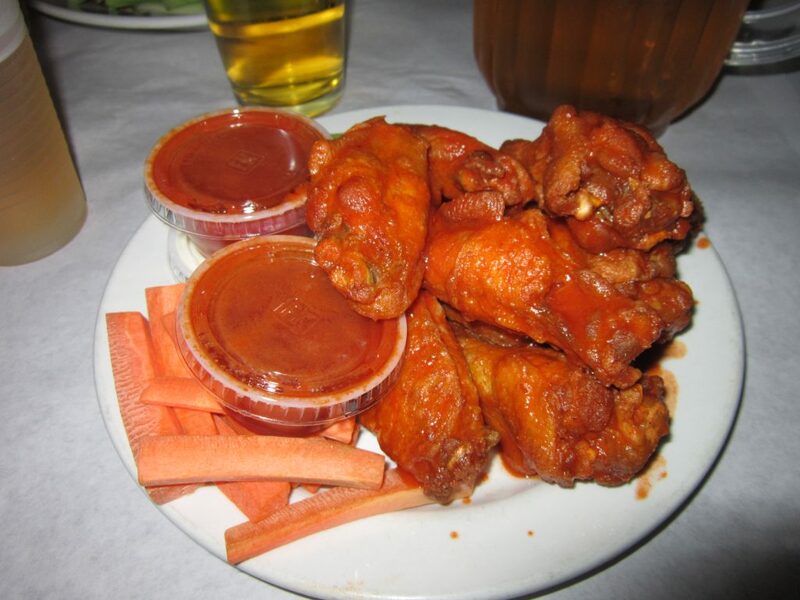 Overall the wings were a success, but New York is known for adding creativity to the most basic things, and I wish this was shown a little more in the flavoring of the sauce. The dish itself took the wings that I expected to find in a normal bar setting and stepped it up by bringing out a larger wing. They were great and left me full and satisfied, but still had plenty of room for improvement. However, the time that I spent eating them will always resonate with me as a great wing experience that I shared with my family, and more importantly my brother. And for that reason, I would like to dedicate this review to my younger brother Matt. May the West Coast treat you well, and if you find yourself missing your big bro, take comfort in knowing that Patrick Molloy’s is right around the corner.